Where did money disappear from Transnistria? Where did the money disappear from Transnistria? This is a question that concerns many people – from pensioners and employees of government-financed organizations to the high-ranked authorities of Transnistria. 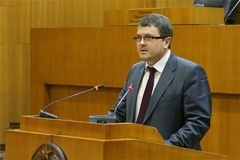 Recently incumbent president Evgueny Shevchuk enumerated horrible facts, in particular, the fact that approximately 90% of gold and currency reserves had disappeared from Transnistria. Also nowadays Transnistria lacks 50 million US dollars to clear expenses and no one knows where to get them from. In the situation when the the metallurgical plant in Rybnitsa has come at a standstill and other factories are letdown, to fill such a budget hole will be difficult. Fulfilling of the gas account is one more issue. The more factories and plants are at a standfill, the less gas is used and as a result less monetary funds destined to pay salaries and pensions are received by the budget. Was such information voiced in a democratic country, civil society and authorities would revolt. But Transnistria is still sleeping. There are no speeches, protests or requirements to arrest guilty people and to make restitution of stolen millions into the state treasury. At the same time concrete people responsible for actual financial decay are well-known: heads of the financial and bank system of Transnistria as well as functionaries having influenced them. Two months passed after the president Evgueny Shevchuk had announced the gold and currency reserves had disappeared but no criminal proceedings were instituted, no inquests are conducted, no persons involved in laundering and theft of state money were arrested. These men who headed financial system, privatization and expense of state funds are still leading a luxury life-style and are confident in a tomorrow’s day. But those poor sufferers who were dismissed and lost their work at a post-Smirnov transition period lack this confidence by saving money on everything including meals. Certainly these people could understand all these difficulties of the transition period if the president took strict, principle measures to punish those who are responsible for poverty. It would be easier for simple Transnistrians to bear the crisis if they saw government fighting corruption and hunting swindlers and thieves. These actions are principle for every conscious statesman. If the government acted like this we would firmly undergo sustainable deprivation without asking ourselves the question ‘What for?’. In this context I as the deputy of the Supreme Council of Transnistria am asking one logical question: when will we see a systemic purposeful struggle against the most regrettable and catastrophic legacy of the ex-president Igor Smirnov – total corruption and stealing? The fate of new Transnistria depends on the answer: will it survive in this difficult situation of a devastating long-term economic decline without financial reserves, when external political pressure on Transnistria is intensifying. Of course, Evgueny Shevchuk is a young president and it would be unfair to criticize him severely in the first months of his governing. But we should require immediate, relentless measures to stop financial and bank crimes. The Republiv and people need stolen money to be restituted. If the civil society see Evgueny Shevchuk make his efforts to do improve the situation it will support him. If not, political fate of our new leaders of Transnistria will be deplorable.